Adult league hockey is incredibly unique. Some leagues and teams have ex-professionals while others consist of middle aged newbies, still gathering confidence on their skates. Skill and experience discrepancy aside our mutual passion leads us to the rink, often at the most inconvenient times. To some it’s nothing more than time spent with other hockey fanatics, preferably with a beer. To a small group of adult leaguers it’s much more than a recreational hockey game. But, to most of us it’s a great opportunity to exercise and add a little friendly competition with some of our best friends. There’s no right or wrong approach necessarily, but a vast majority of players will find themselves in the middle of the ADULT LEAGUE CHILL SPECTRUM, in what statisticians call the 95% confidence interval… but I won’t bore you with academic jargon. Those residing on the extreme ends of the spectrum are few and far between, but we’re confident you’d recognize their characteristics around the rink. Tonight’s game is viewed as a social gathering rather than a semi-competitive hockey game. Winning is preferable but playing the greatest game on earth with some of our favorite people is what it’s all about. Nothing is as important as tonight’s game, impacting their mood the rest of the week. 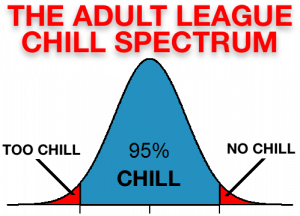 Where do you and your teammates live on the adult league chill spectrum?